This controller is designed specifically for charging two independent battery banks. The owner can set charging priority between the two battery banks in steps of 10%. For example, you can decide that 90% of the solar current should go to the house battery and 10% to the start battery. When one battery bank is full all the power is redirected to the other battery. • Advanced PWM four stage algorithm with bulk, absorption, float and boost (equalization) charging. • Charging voltages are optimized for the selected lead-acid battery type (liquid, sealed or gel). 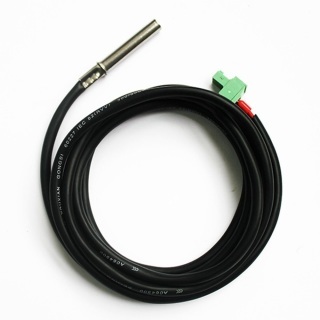 • Temperature compensated charging using either a built-in temperature sensor or an optional remote sensor. • External backlit LCD display can be mounted recessed or in a provided frame up to 10 m (33 ft) from the charge controller. 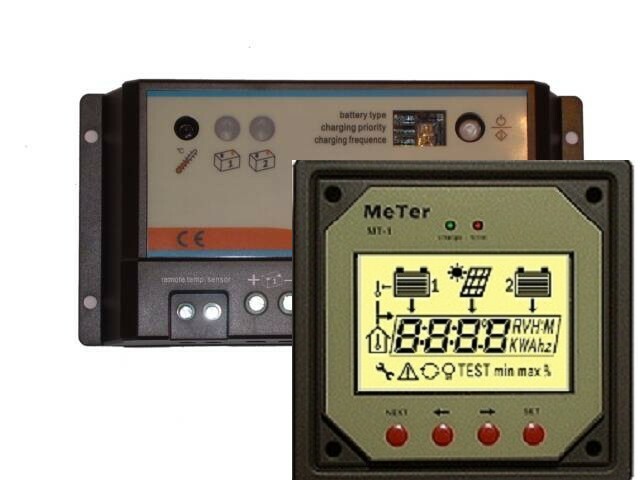 • Display shows charging voltage, actual current, max current and total amp-hours provided by the solar panels. • Display shows current, minimum and maximum voltage of each battery bank as well as charge provided in amp-hours. • Other information includes temperature, time, charge priority and frequency settings and troubleshooting information. 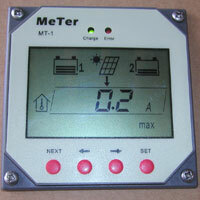 • Charge controller: 6" x 3 1/16" x 1 3/8" (155 x 77 x 35 mm). Weight 8.8 oz. (250 g) for 10A model, 10.6 oz. (300 g) for 20A model. • Remote display: Cutout hole if flush mounted: 3"(75 mm), face plate 3 3/4" x 3 3/4" x 5/16" . 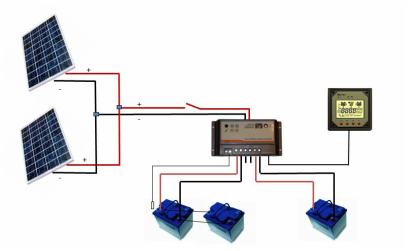 For 12V and 24V systems (nominal voltage), automatically sensed. Charging voltages given below should be multiplied by 2 for 24V operation. 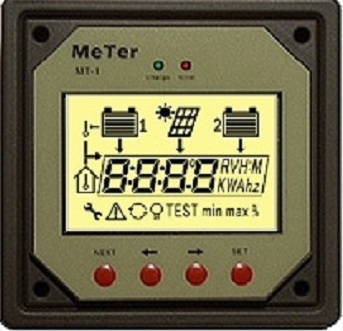 This optional remote display provides all the information you need to track the performance of your solar panel. It is particularly useful when optimizing panel tilt using our top-of-pole mounting system. The display plugs into the Dual Bank Battery Controller. Monitors and Displays Condition and Charge of both Battery Banks. Solar Charge shown in volts, amps, amp/hr. rate, and frequency rate. Displays % of charge for both batteries. Battery Charge shown in volts, volts min., volts max., and amp/hr. stored. Displays both Battery Banks Separately. Displays Time and Local Temp. Optional RTS Displays Battery Temp. and Adjusts Charge Rate. The optional remote temperature sensor constantly measures and displays storage battery temperature so the controller can adjust charge rate appropriately. This is especially important when using temperature sensitive gel batteries. This option will increase battery life by 100-200 charge/discharge cycles. The sensor plugs into the Dual Bank Battery Controller and is attached to the top of a battery in the battery bank with tape. Charge two independent battery banks at the same time. 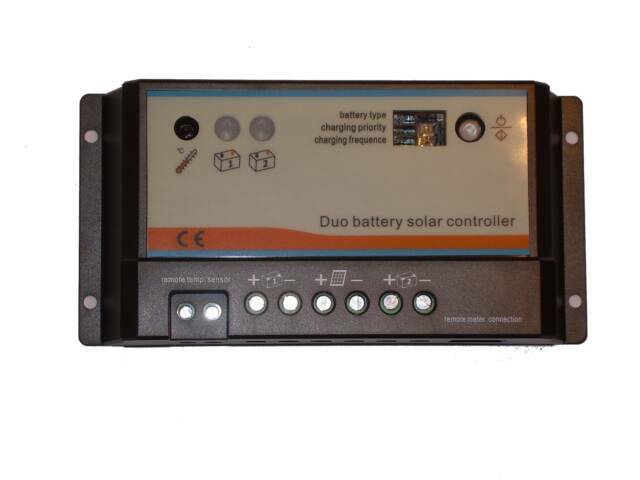 This is an excellent PWMcontroller for all of our CMP marine solar panels. This is an excellent PWMcontroller for two of our panels connected in parallel. Get all the information you need to monitor the performance of your solar panel. This is a very popular item with our customers. 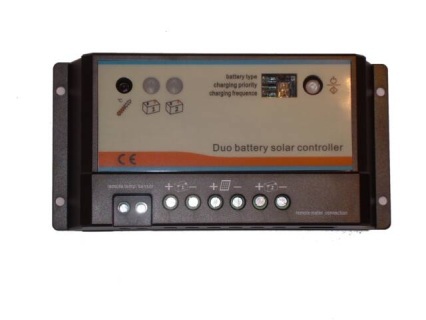 Purchase the complete solar panel control system and save.